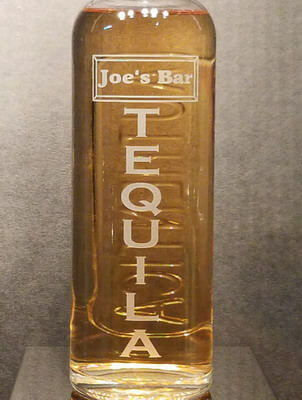 A perfect serving bottle for the alcohol of your choice! 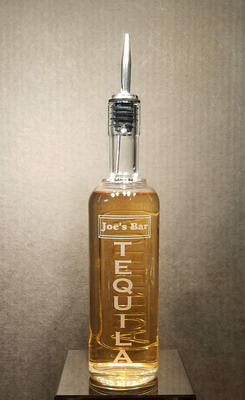 This luxury barware bottle is carefully crafted to optimize mixed drink preparation and presentation. The bottle is crystal with the back of the bottle imprinted with Authentica. Comes with silicone/stainless steel pourer. 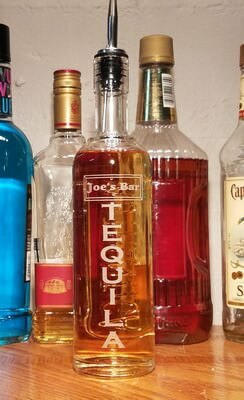 You can have any liquor name that you'd like (for example, Tequila, Rum, Bourbon etc..) and the name of your bar, although you can leave that off if you like. The font is up you too if you'd rather have a different one.